WebGrab+Plus grabs and creates to custom EPG (Electronic Program Guide – XMLTV format ) from selected tv-guide sites for your channel list. We want to write about it because of many users request help. We hope this article helps to who could not use the program before. This tutorial has been prepared is for WebGrab+Plus v1.1.1 version. Run to install.bat file in extracted folder. 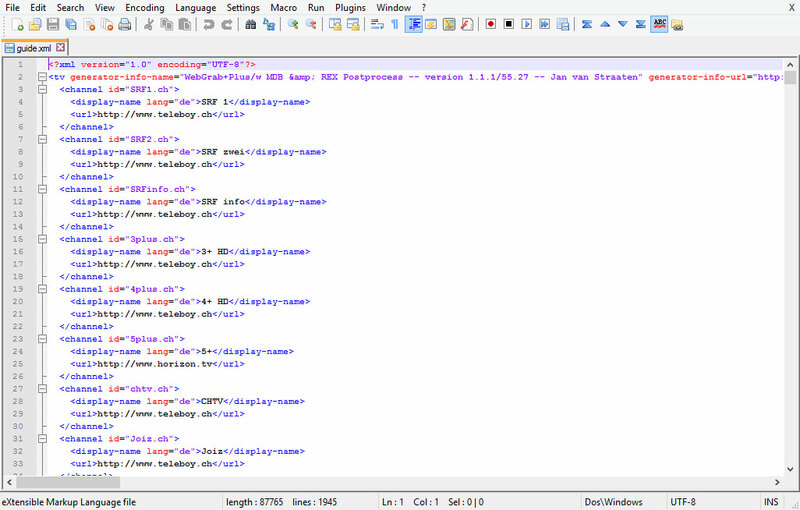 Extract to ini and xml files to C:\ProgramData\ServerCare\WebGrab directory. 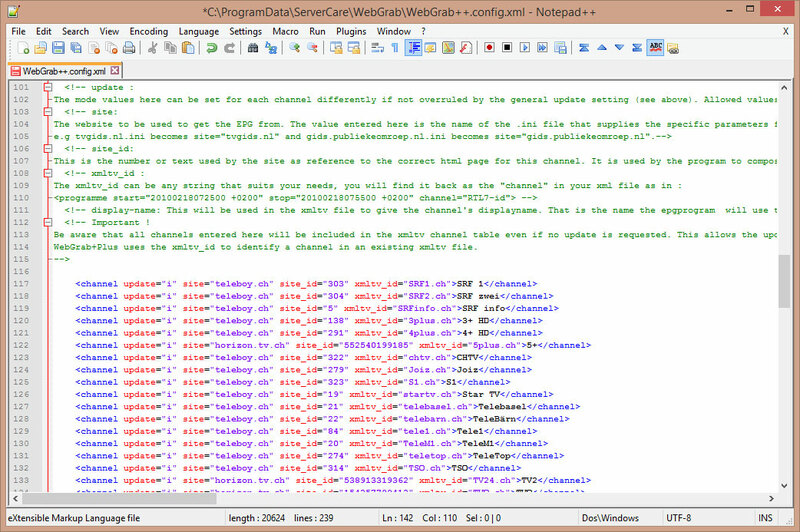 Open to WebGrab++.config.xml file in to C:\ProgramData\ServerCare\WebGrab directory. Go to line 12, change to output directory and give a name to xml file. Go to line 82, edit <timespan>0<timespan> for which shows will be grabbed. 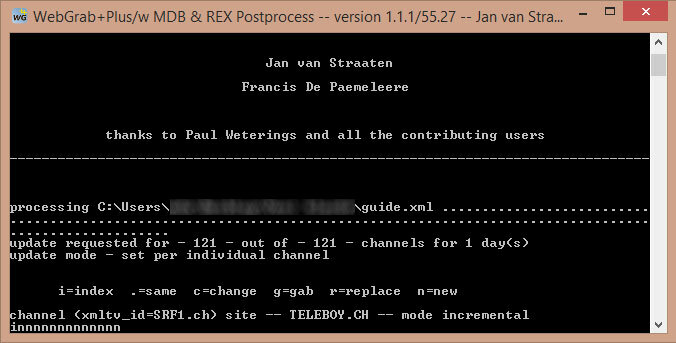 Now you can add your channels in to WebGrab++.config.xml file. Copy to channels opening the XML file in your downloaded channel packs or by clicking to X icon of packs on page. You can combine all channels from different countries, just do not forget to download and extract channel packs to C:\ProgramData\ServerCare\WebGrab directory. We show how to use WebGrab+Plus easily, if you have any problem feel free to leave a comment. Hi, i have a problem , file mdb.xml not found, becouse of that i can’t create my xml file, how to fix that? It’s in C:\ProgramData\ServerCare\WebGrab\mdb folder. Remove all files, download and install again. It takes more than 20 minutes to reate the guide.xml file for the tvguide uk channels. Is it normal? In WebGrab++.config.xml I wrote a timespan of 3 days.What will happen after that? Do I have to run again the program or it will update the guide.xml file automatically in the background? It’s normal, you have to run again after 3 days or you can use windows task scheduler to automated process. long description takes a long time and hangs on my PC. without long description is better for me. What should I change in xml? There is no such function, that feature is related your device software. Did you get this working? I got a guide.xml but when I uploaded the contents to Pastebin just the contents and linked it to my IPTV player but doesn’t show anything. Having same issue. File generated successfully, but when imported into kodi nothing is showing up. I’m having problems with this, I followed your guide. I got a guide.xml but when I uploaded the contents to Pastebin just the contents and linked it to my IPTV player but doesn’t show anything. take a look at manyplay de!